This is Angie Across America's first ever feature on a U.S. independent (indie) film review site based in New York. Super stoked! STARVE THE DOUBTS PODCAST, U.S.
CHRISTIAN RADIO TALK SHOW, U.S.
Dec 18, 2014: I was invited to be a guest speaker on a Chinese Christian Radio Station. I don't speak Mandarin very well - the show hosts had to translate extensively on my behalf. Time to brush up on my Mandarin! Nov 24, 2014: Deeply honored and privileged to speak to law students at my alma mater, Temasek Polytechnic, about having a dream and pursuing it tirelessly and relentlessly. Nov 20, 2014: I've always dreamed of being a news anchor from a young age - now, my dream came close to pass when I was featured live on Singapore's national TV and premier news channel. 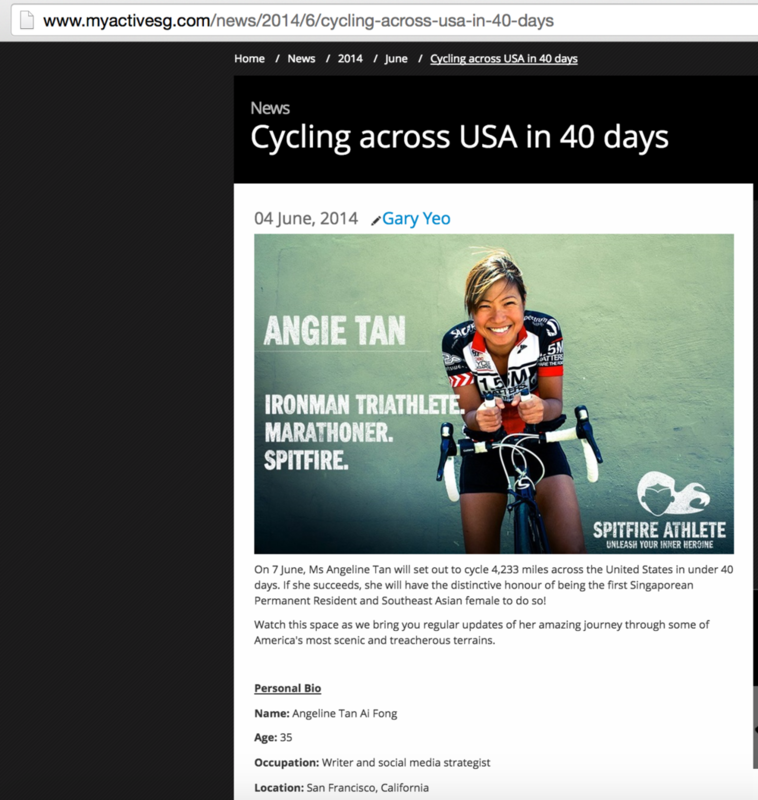 I am proud to be the first Singapore permanent resident to embark on a record cycle adventure across the United States. Jul 23, 2014: A day after I completed my record 4,000-mile cycling adventure across America in 39 days, I got on a two-hour call with a journalist from The New Paper in Singapore to talk about the euphoria and challenges of the ride. Here is the spill. The celebrated Southeast Asian (SEA) Games 2015 was held in Singapore. In commemoration of the Games and Singapore's sporting history, the SEA Games highlighted my endeavor, hailing me as the first Southeast Asian female to cycle across America in 39 days. Jun 11, 2014: Day 5 on the road. The Singapore Sports Council featured an update on my report from the road. Jun 4, 2014: The Singapore Sports Council, in conjunction with the 28th SEA Games 2015 which will be held in Singapore for the first time, featured my cycling adventure as a means to inspire Singaporeans to get active and inspired. May 15, 2014: I belong to one of the largest churches in the world today, City Harvest Church, in Singapore. 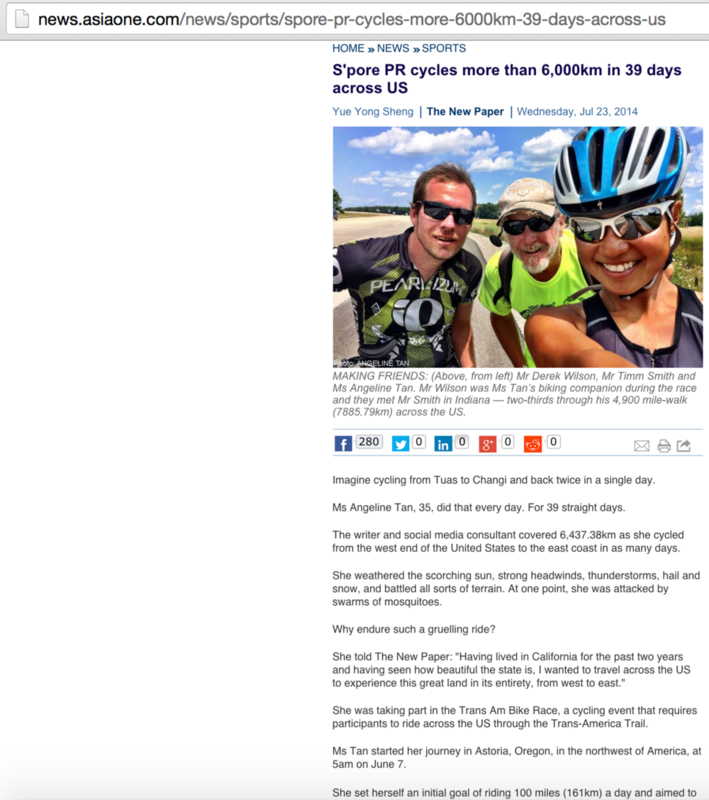 In support of my endeavor to be the first Southeast Asian female to cycle across America in a record time of under 40 days, the news arm of the church featured my story to rally support for my cause. BLOG: AN ANGRY ASIAN MAN, U.S.
Apr 10, 2014: Contrary to its web moniker, the man behind Angry Asian Man, Phil, is really a super nice guy. 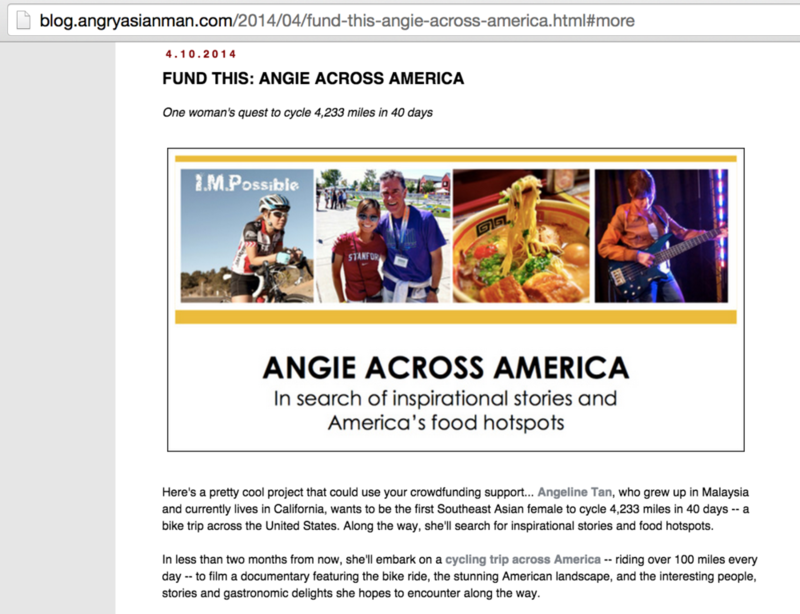 He barely knew me, yet he kindly featured my cause on his blog to rally supporters to fund my project when I first pitched it on Kickstarter in April 2014.